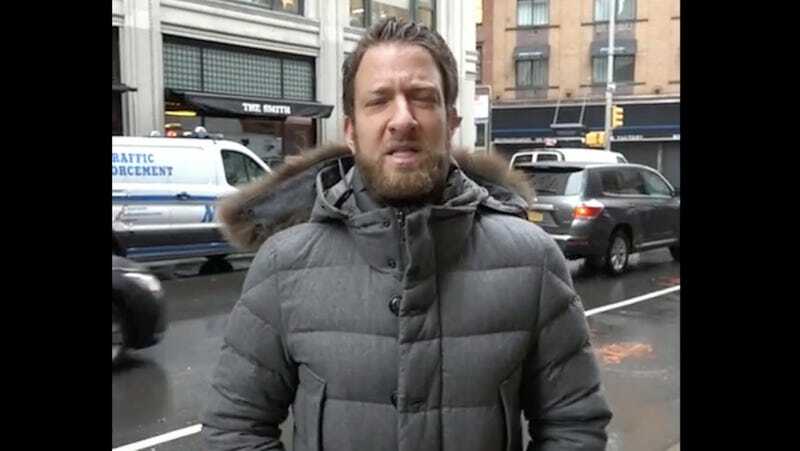 Sociopathic Barstool Founder Dave Portnoy Giddy About "Suffocating" ESPN Host Sam Ponder In "Online War"
Barstool Sports founder president Dave Portnoy yet again has gleefully engineered a targeted harassment campaign against a woman who he thinks wronged his company. As any woman in sports media who has drawn the ire of Barstool in the past can tell you, tweets and blog posts from the site’s employees are a precursor to sustained harassment from the site’s rabidly misogynistic fanbase. Portnoy understands this just as well as anyone else, and spent yesterday encouraging Ponder’s harassment. “I like to make them laugh through pain,” responded Portnoy, which elicited a grin and a “hell yeah” from one of the other freaks in the radio booth. Though this behavior would seem to go against Barstool CEO Erika Nardini’s stated “zero-tolerance harassment policy,” she did not respond to a question asking her what she is doing, either publicly or privately, to stop the president of her company from tormenting Ponder. Neither did Mike Kerns, the president of digital at Chernin Group, the company that owns Barstool. I asked Sollenberger—who co-hosted Barstool’s canceled ESPN show with Katz and who previously declined to condemn his boss’s pattern of abusing women on the internet, but did say he has discouraged harassment on his podcast—what, if anything, he and Katz were doing to stop their boss’s harassment campaign against Ponder. Perhaps it’s not surprising that Katz and Sollenberger don’t have anything more pointed to say about Portnoy’s campaign against Ponder, which follows the same playbook used by Gamergaters, alt-right trolls, and other groups whose specialty is bullying people off the internet. As Katz said on the radio yesterday, he just wants to “make people laugh,” and sometimes that requires not thinking too hard about the actual world around you. For example, the pair recently appeared on Sports Illustrated’s web show, The Wilder Project, to joke about their ESPN TV show getting canceled because their site has a history of attacking and bullying women. Maybe one day they’ll be able to look back on Portnoy’s actions from this week and laugh about them, too.